Cut scallops into thin slices, about ¼ inch thick. In a bowl, combine lemon juice, blood orange juice, shallot, and chilies. Toss with scallops and allow to “cook” for 20 to 30 minutes. Marinating the scallops in a highly acidic juice like this changes their protein structure in a way similar to cooking by heat. The longer the scallops sit in the marinade, the more opaque and chewy they become. An ideal way to serve these is what would be considered ‘medium-rare,’ with the outside of the scallops being firm while the inside remains tender. Scoop scallops out of marinade and place onto shells for serving. 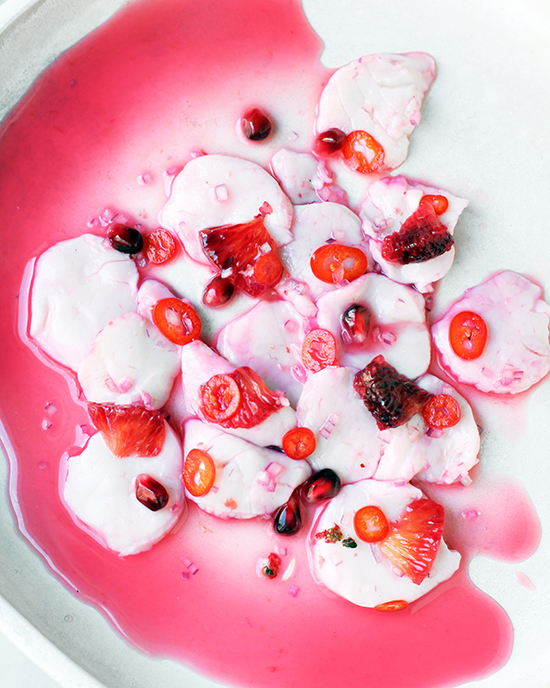 Top with blood orange segments and pomegranate seeds. Finish ceviche with pink peppercorns and sea salt. Recipe Notes: If using live sea scallops, first run a knife along one side of the scallop to release the meat. Then open the scallop and release the other side from the opposite shell. Peel off the skirt and rinse the scallop before using.